Each Elemetal Privateer Round consists of two ounces of .999 fine silver, and is manufactured in an IRA approved facility ensuring the metal purity and production quality. Precious Metals industry: Ohio Precious Metals (OPM), NTR Metals, and Provident Metals. The goal of this collaboration is to offer high quality, investment grade bullion at a price that is accessible to every investor. Each partner in the Elemetal Mint offers unique attributes and assets that accommodate this goal. OPM, an LBMA certified mint, has a legacy of producing high quality Precious Metal Bullion that meets standards required for global institutional trades. NTR Metals offers a production capacity that allows the Elemetal Mint to produce bullion as demand requires. Provident Metals leverages advanced fulfillment technology and processes to ensure that bullion is offered at the lowest possible price, and delivered in a timely manner. The obverse of the ultra high relief Elemetal 2oz Privateer Silver Round carries the inscription “NO PREY NO PAY”, which is a piratical term meaning that unless a raid was successful at acquiring valuable commodities, the privateers would not receive a commission. Likewise, if contemporary investors are unwilling to invest in Silver Bullion, they will miss the security and value that only precious metals offer. 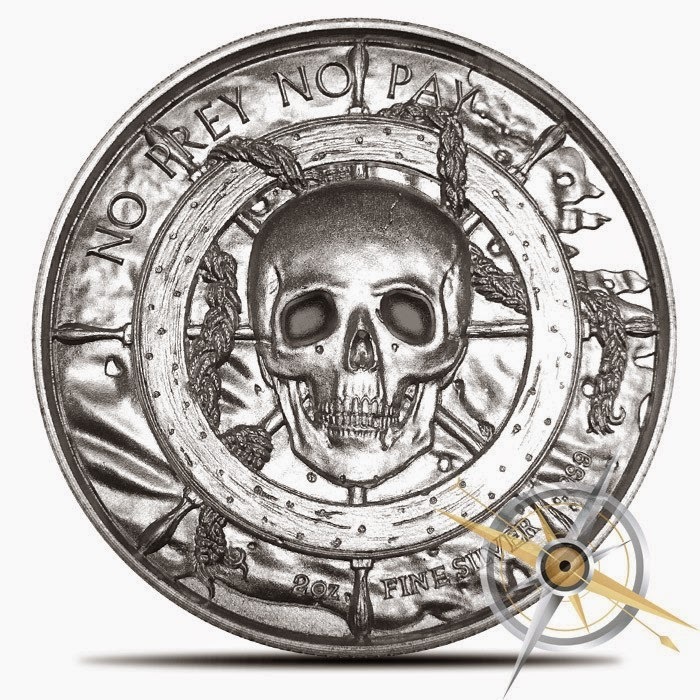 The obverse of the Elemetal Privateer Round also features a skull over a ship’s wheel, reminiscent of the Jolly Roger, and the inscription "2OZ FINE SILVER .999". 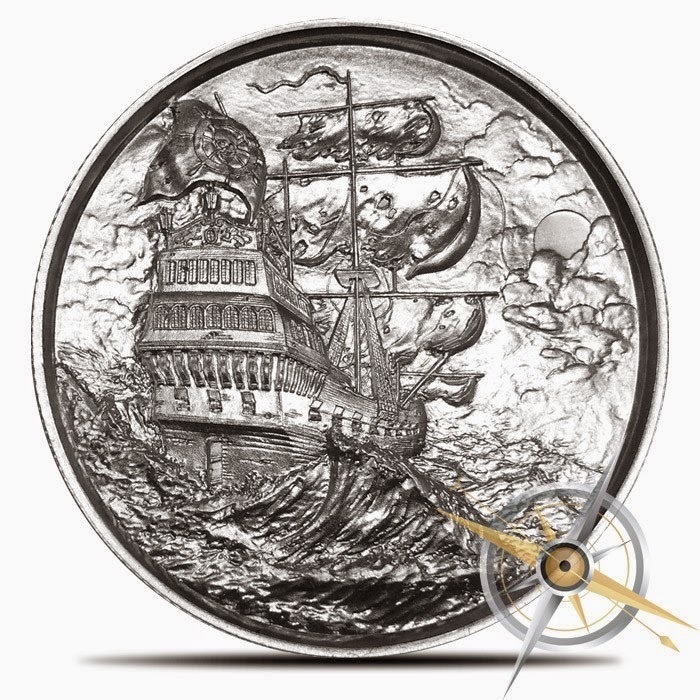 The reverse of this 2oz silver round features the stern of a pirate ship, the ship drifting through rough seawaters. High waves roar across the design as the ship’s sails flutter in the wind. The moon peaks out from the clouds on the right of the image. The Elemetal 2oz Ultra High Relief Privateer Silver Round is a beautiful addition to Provident Metals’ offerings of Privately Minted Bullion. Each of these 2oz Silver Rounds is IRA approved and will ship in New Condition. Individual rounds ship in poly bags, and quantities of 10 or more ship in plastic tubes.